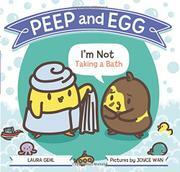 Peep and Egg are back, and this time Egg will not take a bath, in spite of obvious need. As the book starts, a two-page spread shows Egg and some pigs wallowing—and having plenty of fun—in yummy-looking milk-chocolate–colored mud. Needless to say, Peep thinks Egg needs a bath, and the characteristically stubborn Egg is having none of it. Baths are “Too wet!…Too bubbly!…Too splashy!” and a proposal of a quick dip in the dog’s water bowl is met with “Too slobbery!” The two yellow, kidney-bean–shaped characters outlined in thick black lines are remarkably expressive. When Egg folds stubby wings and brows become a mulish-looking straight line, Peep admits defeat—or is it a trick?—“Okay, I guess you are not taking a bath today.” Peep gathers some toys and off the chick goes. “I’m going to take a bath myself.” Young children and their adult readers will not have to wait long for the predictable reaction: “Hey, Peep!” Then: “Peep! Wait for me!” As the book ends, Egg is having fun in the pond with all the other animals, and, yes, though Egg is now nice and clean, the contrary chick will not come out!